I never thought I’d be the type of person who got home from work in the evening and made whatever would get in my belly the fastest for dinner, but that has been my situation lately. Right now we leave for work at 7:20AM and usually get home around 6:15-6:30PM. During the day I get it in my head that I’m going to get home, exercise, make a nice dinner, do some chores or poke around on the internet and still maybe have time to watch tv or read before going to bed at 10. Right. What happens lately is that I cook up whatever is quick and satisfying and try to check a thing or two off my to do list, and before I know it the night has gone by. Hopefully in a few months bf and I will be able to align our work schedules and I’ll gain another thirty minutes to an hour which will ease things a bit, but for now it’s all about fast, effective dinners. 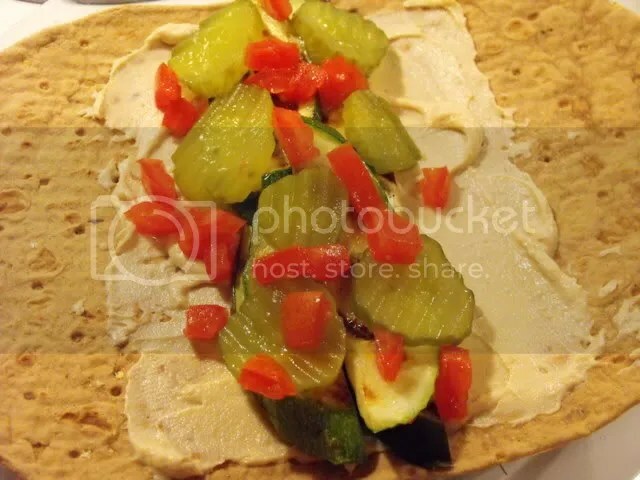 Here’s one from last week: grilled eggplant and zucchini on whole wheat flatbread with hummus, pickles, lettuce and tomato. The eggplant and zucchini were from the farmers market, and the tomato from my backyard, where the tomato plant is STILL producing new tomatoes. In November! This is before I piled on the lettuce. 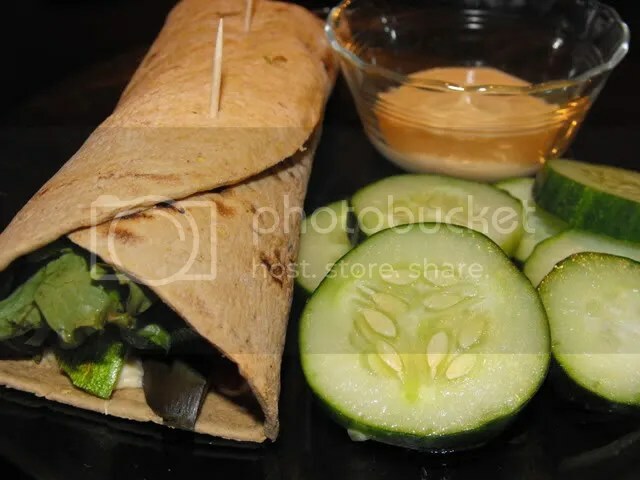 Rolled up, with cucumbers and tahini dip. 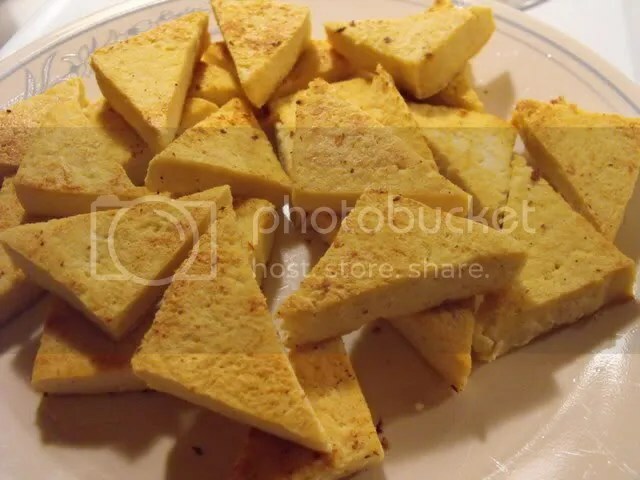 Tuesday night I was planning on a simple stir-fry with leftover veggies and frozen-then-thawed tofu, then while perusing The PPK I saw this post on dry frying tofu with a link to these instructions and became very intrigued. I also decided I wanted a “real” sauce with my tofu instead of just a plain stir-fry, so I found this recipeon Vegweb and modified it a bit. 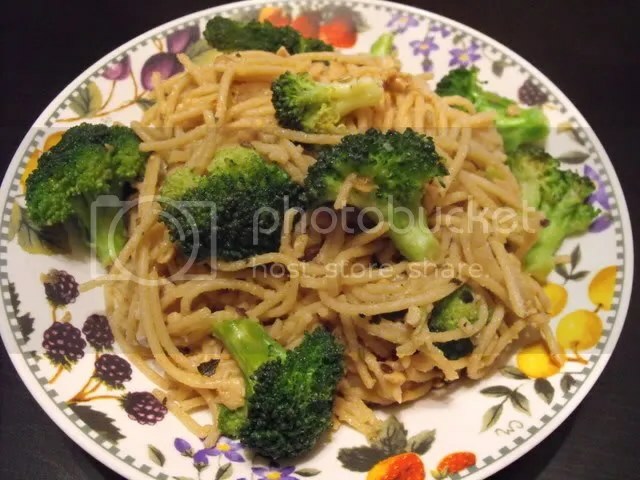 I was going to post the recipe because it turned out really good, but I’m not at home right now so I don’t have it. Will post it next time! Here’s the dry-fried tofu. It took just about forever to do because I was using my wok which doesn’t have much flat space so I had to fry the tofu in three batches. With a griddle or wider pan it would go much quicker. 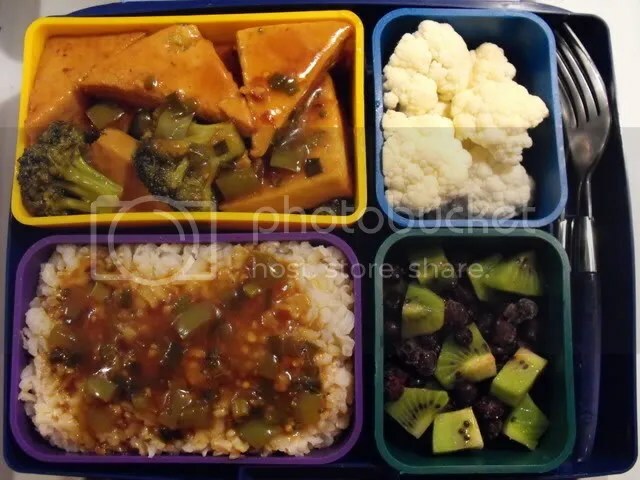 I really liked the texture of this tofu and will definitely be preparing it this way again. I also liked that I didn’t have to use any oil! 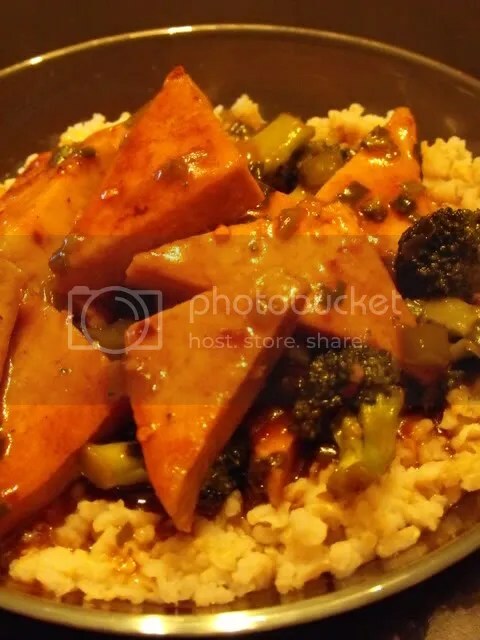 This orange tofu & broccoli was incredibly good, even served with overcooked, mushy instant brown rice. The sauce has a very intense flavor, with lots of acidic quality, but it tastes great if you can get past that. I was kind of afraid my stomach was going to get upset afterwards, but on the contrary: I got the happy tummy, bigtime. You know how sometimes you eat and you’re still hungry or unsatisfied, and sometimes you eat and it was a bit too much and you don’t feel so well, but sometimes you eat and it’s just perfect and your tummy is sooooo happy. That’s what this dish does. Wednesday night I got home with no exact dinner plan and went straight for comfort. 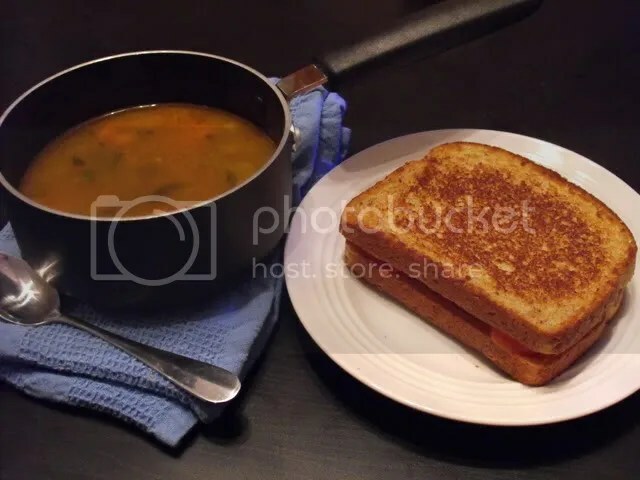 Organic veggie soup from a can and a grilled cheese with pickles and tomato on whole wheat. Hot, crunchy, slurpy and good. And I tell you, pickles on grilled cheese is the way to go. And here’s my Thursday dinner made from what I could find in the house. 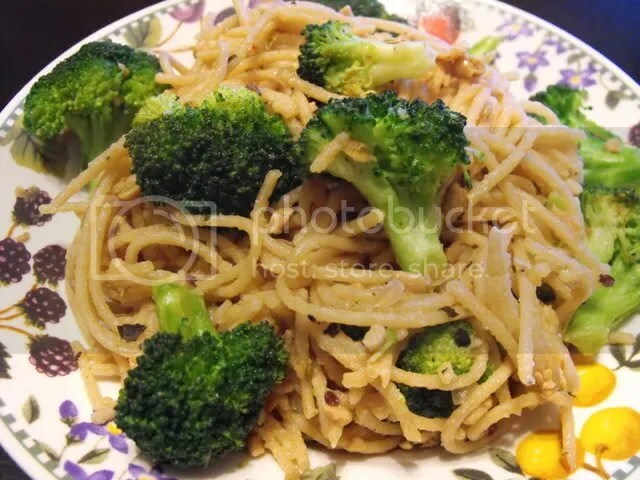 Whole wheat spaghetti with broccoli, garlic and some tempeh sausage crumbles that were hiding in the freezer. It would’ve been better with pine nuts and almond parmesan, but I’m still working on fully stocking my kitchen. I think tomorrow when I get back home I might come up with a food plan for the week and get my grocery shopping done. 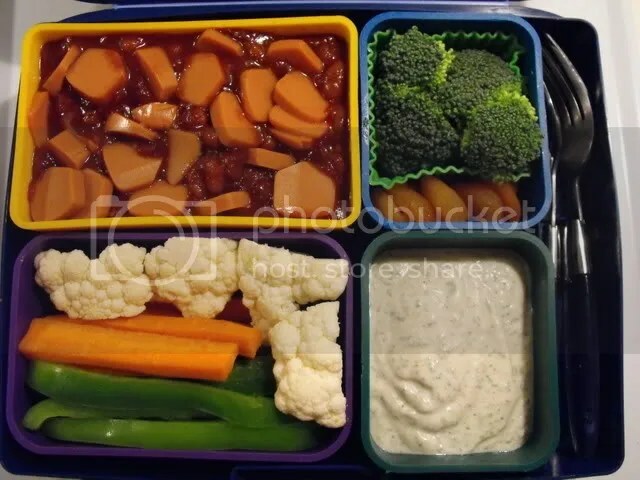 I was reading yesterday that Jessy from happyveganface plans all her meals for the week ahead of time and I think that’s adorable. 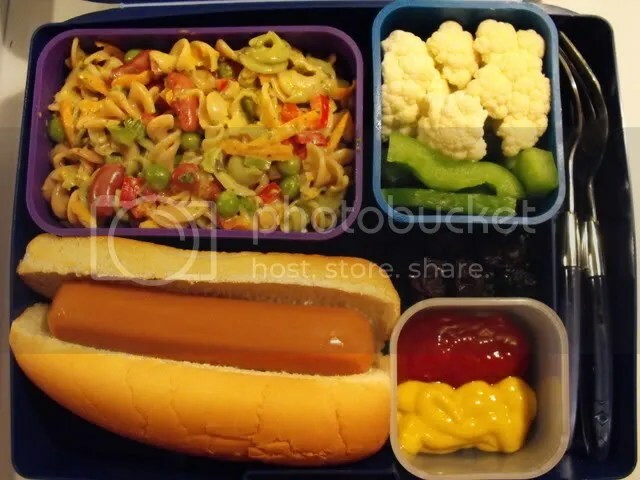 I only took three laptop lunches this week. Thursday I was in a mega hurry and grabbed some instant pad thai and a salad, and Friday my office held a Thanksgiving potluck for our students which was really interesting because most of them are from other countries and didn’t really get the whole pot luck concept. Last week Miss Bianca of Vegan Crunk tagged me for a meme, and now is the time. 1. I don’t know if I’ve mentioned it before on this here blog, but I’m a musician. I started taking piano lessons when I was five, played flute in middle school band, picked up trumpet in ninth grade, and was a total high school band nerd. During my third semester in college I switched majors from civil engineering to music (smooth move) and hold a BM. Seriously, it’s a Bachelors of Music. I have a BM. I’ve played trumpet, guitar and sang in ska punk bands, fronted a pop-punk band and switched off on bass and drums in an all girl punk band. I sang harmony and played trumpet and flute on a couple recordings for local bands when I was in Gainesville, including one release that came out on Epitaph. I’m kind of a big deal. 2. I’ve been afraid of sharks for almost as long as I can remember. I know when I was a little kid I liked the beach and swimming in pools, but somewhere along the way I became terrified of sharks and ocean creatures in general. I think it came about because there was a science museum my summer camp visited, and there was a stuffed hammerhead shark hanging above the staircase that you had to walk up to get to the exhibits. I didn’t want to walk under it. I also think this brought about my phobia of taxidermied animals. I can’t go to natural history museums. I don’t much like being around mounted deer heads and things of that nature, but I REALLY can’t do whole big animals like bears or panthers. At one of the Smithsonian museums in Washington D.C. there is a taxidermied elephant in the lobby and it’s kind of my worst nightmare. Although, in recent years I have been facing my fears and getting better about it. I’ve gone to a few aquariums and planted myself in front of the shark tanks, and I went to that museum in D.C. and looked at the elephant from the second floor. I still couldn’t stand right next to it though. 3. Although it’s not another phobia, I can be very uncomfortable around certain large things. Like cruise ships for instance. I don’t mind being on one, but standing next to one in a harbor can get to me. Airplanes too. Dinosaur skeletons also freak me way out, but I’m not sure whether they fall under this category or the dead animal fear. 4. I was kind of obsessed with Alice in Wonderland for a while. I collected all sorts of memorabilia and books, whatever I could get my hands on. I had a large collection for a while, and sold it all off a few years ago for the money. I still have the pictures and the memories though. If you’ve never actually read Lewis Carroll’s “Alice’s Adventures in Wonderland” and “Through the Looking Glass”, do so. They’re fascinating. 5. I don’t like olives or licorice. Disgusting. Or Jagermeister. Barf. Those are pretty much the only flavors I can’t stomach. I’m coming around on olives, but only if they’re mixed in with other complimentary flavors. 6. There are a few tv shows of which I refuse to miss an episode: Top Chef, The Office, Project Runway and The Biggest Loser. We just got DVR so it’s making my life much easier in this respect. Other current shows I really like are What Not To Wear, Law & Order (SVU or Criminal Intent – love Vincent D’Onofrio), and Top Design. I like reruns of Gilmore Girls, King of Queens, Frasier, Full House, Golden Girls, Friends, Seinfeld and Family Guy. These things comprise most of the tv I watch other than sports. I know way more about Full House than any person should. 7. I don’t do scary. Can’t watch scary movies, especially if it’s about supernatural things like ghosts or monsters. Real life scary I can sometimes do, such as murder mysteries or thrillers. Thing is, watching these kinds of movies I get too worked up and my heart beats to fast and I end up with a headache and generally I just don’t enjoy the feeling of being scared like most people do. I kind of like true crime books though. I’ve read Helter Skelter and Danny Rolling’s biography and while they were intensely interesting, they scared the living crap out of me. I thought Charles Manson was hiding in my apartment every day I came home from school during the time I read Helter Skelter. Huh, that was a lot easier than I thought it would be! Guess I’m a fairly interesting person. I tag anyone who hasn’t done this yet and wants to, or better yet, tell me something random or weird about yourself in a comment!